The other day I shared a bit about my experience in Denyse Schmidt's improv patchwork workshop that I was lucky enough to attend at QuiltCon. Since I returned home last week, I haven't been able to get these blocks off of my mind. And I've added quite a few to the ten or so that I finished in Denyse's workshop. I'm trying to construct the blocks as randomly as we did in Denyse's class. I even made my own version of scrap bags similar to those that we used in her workshop and have been choosing fabrics without looking. It really is a lot of fun to work this way and I love the result. 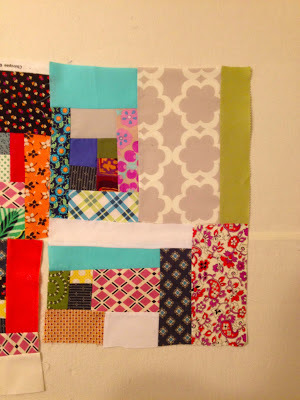 Each block is totally unique and this technique forces you to use fabrics in combinations that you may never would have otherwise. And somehow, if you trust in the process, it all works out in the end. You start to notice relationships between the blocks as they come together: the repetition of color, shape, and pattern in what seemed like completely random blocks. This isn't the final layout of the blocks. I'm just hanging them on my design wall as I go, and in fact, I'm not even sure what I'm going to do with all of them. 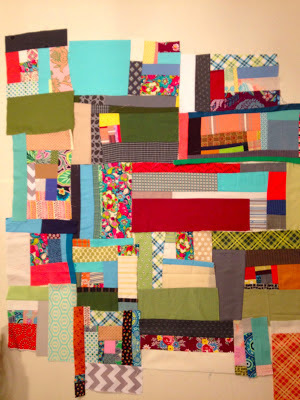 I have a couple of baby quilts that I need to make, but I wonder if something like this would be too much for a project like that. Here are my two latest, which I finished the other night. The one on the bottom has a large piece of Denyse's corduroy for FreeSpirit fabrics and it adds such a great texture to that piece. I'll keep you posted on the progress of them and the finished quilt, or quilts, that they become. Looks great. Can t wait to see more!